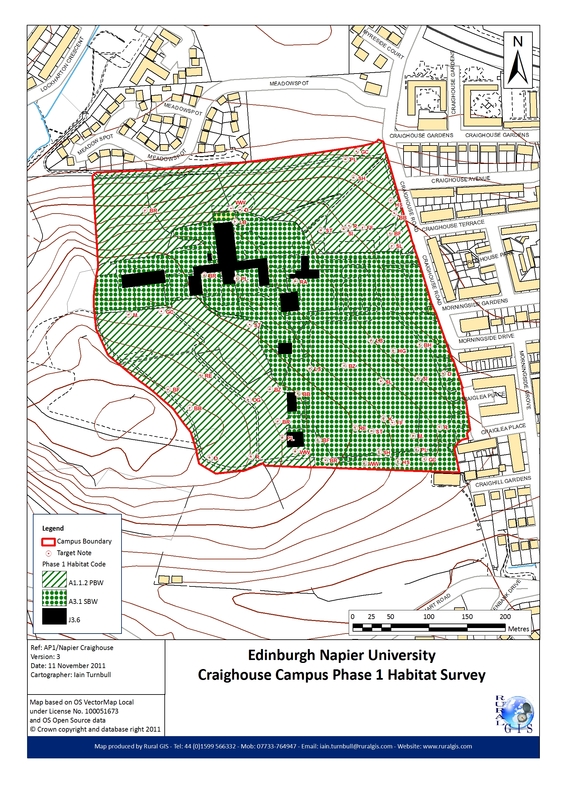 Rural GIS was contracted by Abi Wildlife Counsultancy to produce digitised maps of a Phase 1 Habitat survey they had been commissioned to undertake of three Edinburgh Napier University campuses. The survey was undertaken using thhe standard Phase 1 Habitat Survey classification and included a number of target notes for species of interest that were recirded during the field survey work. The three campuses were Craighouse, Craiglockhart and Merchiston, as shown in the map on the left. Rural GIS produced base maps using Ordnance Survey VectorMap Local data and some OS Open Data. These were used to record the boundaries of each habitat and the location of the Target Notes. The paper maps were digitised by Rural GIS and the results mapped according to the standard colour scheme. The map below shows the Craighouse Campus Habitat Map, this can be viewed in gretaer detail by clcking on the Map image.